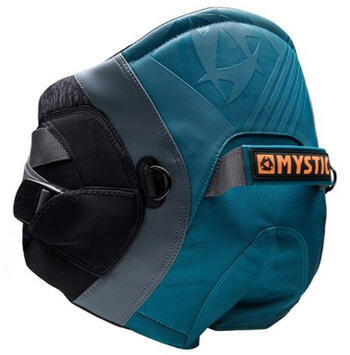 Completely re-built and updated, the Mystic Aviator seat harness is now even comfier and more supportive than ever with a smart new teal and grey fleck colour scheme. Constructed with the most durable materials on the market with integral internal webbing structure to spread the load and stresses around your entire body for ultimate comfort. The Mystic Aviator comes with padded leg straps and spreader bar as standard. Also included is a pull down strap to keep the spreader down and in position even when the kite is above your head. A stainless steel hook is used to make a quick connection with the spreaderbar. The webbing of the two points system is placed on different locations to spread the load more evenly over the harness. The spreader bar is pulled down in the middle of the bar with the spreader down strap. The system prevents the spreaderbar from riding up, causing pressure on the ribs.